.....You should..... because I'm there. I want to make him another scarf, a nicer one, so I decide the cross stitch scarf pattern in my new 101 Designer One-Skein Wonders book would look nice on a guy. Well, the directions for that "cross stitch" are lousy. There are several ways to interpret what they're saying, and I know I'm doing it wrong, but the other ways I try aren't so hot, either. 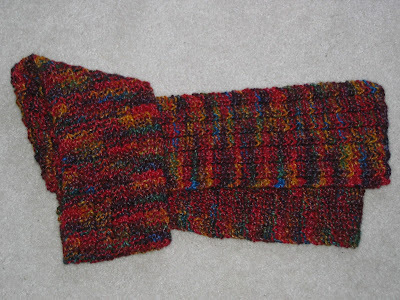 Not to mention the fact that the shades of brown Noro Kureyon I'm using doesn't show up the stitch pattern at all. I guess it's time to ...rrrip. But, being determined and tenacious, I forge ahead with another yarn from my stash that is sure to show up the stitch definition better. It does, but the cross stitch is a pain-in-the-neck to do, at least in my opinion, and it has a VERY definite back side to it, so forget that business... rrrip. Next, I decide to try my hand at some mohair lace (mistake, that). I've been wanting to make something for the friend that gave me several boxes of yarn last summer, and a mohair lace scarf should be just the thing, right? WRONG!! Just didn't like the pattern at all. Those yo 4X really make BIG holes, so about 6 inches of mohair lace later...rrip. I know!! I'll try another pattern! What a great idea! And this one has beads besides (very cool). Can't say much for the way this one shapes up--the beads make the bottom flare and ripple way more than any blocking will compensate for, so... rrrip. Forget the scarf. She loves jewelry, and I will make her a very cool bracelet. At least I know that will turn out. Okay, now I need a knitting pick-me-up, so I'll make a dishcloth with some of the stripes cotton I've been anxious to try. Can't go wrong with a dishcloth--it's like falling off a log. I know... you're way ahead of me here... the pattern I choose just happens to be one that doesn't work well with the stripes yarn. All kinds of knit stitches on the right side and that does nothing for the look of the yarn. Once again, it's time. Rrrip. So you see, the fact that I have no FO's doesn't necessarily mean that I haven't been knitting. 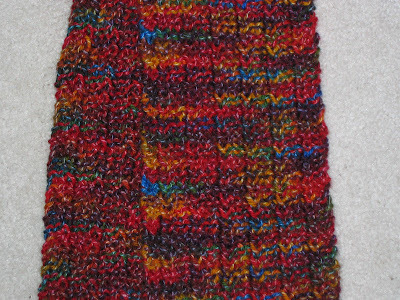 And despite all my knitting angst, I did finish one scarf that I actually like. It's the One Row Handspun Scarf from Yarn Harlot. I used a skein of Mountain Colors that I received from my friend. Yes, same friend who will not be gettting a mohair scarf. The stitch definition shows up better in person, and the little thread of white you see here and there is just the slightest dash of silk. It's nice and soft, and I think I'll break it in today when I go visit my mom. We've been having nice weather, but it's colder today. When I looked a while ago, my little weather pixie said it was only one degree. Could be worse, but that temperature does call for a nice, new scarf, no? Melt butter. Turn off heat and add brown sugar. Stir til smooth. Stir in egg. Stir together flour and baking powder and stir into brown sugar mixture. Pour into 8x8 sprayed pan and bake at 350 degrees for 20 minutes. When cool, dust top with sifting of powdered sugar. Love the yarn in your pic. Very pretty. the scarf is beautiful and I love those cookies I make them often!! 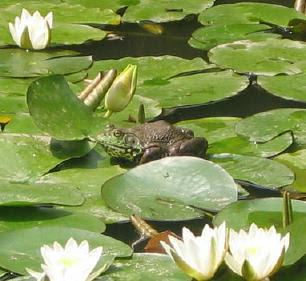 Alana - it sounds like you've been living at frog pond! Come back to the city, will ya? I've had days like that. I get so frustrated because I just want to knit something...anything! LOL Glad you finally found something that worked for you! It looks great! It's too cold to be at the pond! Just wanted to let you know I am knitting away on your dishcloth. I hope to have your package out no later than the end of next week.